Sometimes doing nothing is the best course of action. That’s my preferred approach when it comes to yard work. My wife has been after me all summer to trim the birch tree branches overhanging along our driveway. Well it’s a good thing I waited. My friend Daniel (video) and I were looking for a good subject to paint close to home last week. Those beautiful birches were there when I needed them most. And they’ll still be waiting for me in the spring. 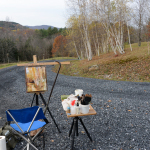 You are cordially invited to join me at the Chaffee Art Gallery in Downtown Rutland this Friday, Nov 14, at 6:00 PM for a free painting demonstration. I don’t know what I’ll be painting yet so it will be a surprise for both of us. Wine and light refreshments will be available. While you are there, enjoy the ongoing “Oil and Water” exhibit featuring the work of my wife Mareva Millarc along with a few of mine. You may notice something new on this auction… a “Buy Now” option. Several friends have suggested this option and I’m going to give it a go. You can use the Buy Now option when a new painting really speaks to you, you simply must have it NOW, and you are willing to pay full price. If someone does purchase the current painting using the Buy Now option, the auction will simply close until the next one begins. All creative endeavors require an open mind, risk, and change. Let’s give this a try. Please note there may be a week or two between now and Christmas that I miss A Day in Vermont post. I’ll be here to ready serve you, with gratitude for considering my artwork this holiday season. The complete collection of limited edition prints (as well as a few originals) are always available for easy ordering on my website. I’m happy to include a personalized gift card with any order. 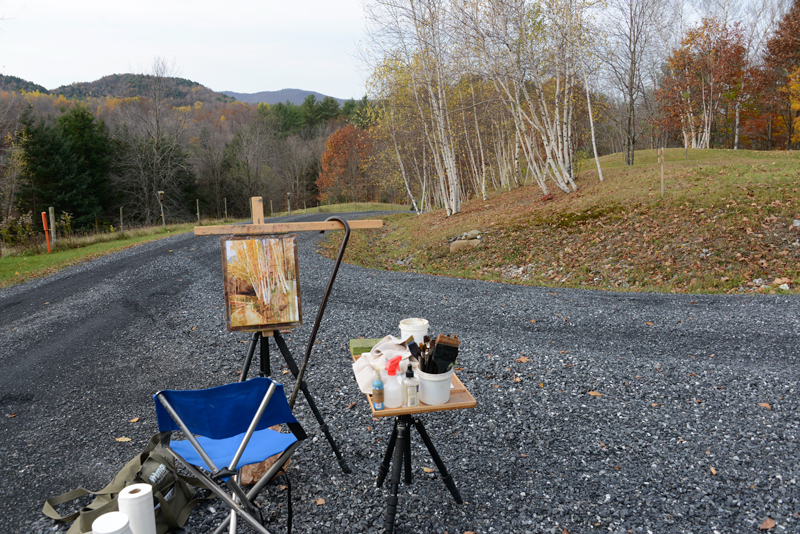 My studio and gallery are open by appointment here in Middletown Springs. Just call or email ahead to schedule an visit. 802-235-2328. All my prints are available here too, and framing can be done while you wait. Thank you so much for your incredible support, now and throughout the year! Our Free Print winner for the month of November is Mary Grennen of Massapequa, New York. My pleasure Barbara, thanks for sharing your Birch tree story. Sometimes when painting “things” I begin to see human personalities emerge. Birch trees strike me as happy and relaxed, enjoying each others company. Another beautiful painting. In the accompanying video, as I watched you carve the white trunks out of the juicy wash I thought you must be using Yupo paper, then I remembered…no, it’s a panel. So, which one is it this time, Aquabord or Claybord? I’ve done oils on Ampersand panels but I’ll have to take these others out for a watercolor drive. Thanks Steve, No Yupo for me. I use Aquaboard and Clayboard for watermedia. Gesso board for oils occasionally. The panel I am using here is a custom prepared surface that I have evolved to over time and much experimentation. Like the porridge in the three bears, it’s “Just Right” for me. I glue wet (limp) Masa paper to an Ampersand board (does not matter as long as it it’s a sealed archival surface) with Miracle Muck. Once dry, I give the surface a thin coating of slightly diluted mat medium. Let that dry, then paint. Have fun! Cool picture! I also tend to put off yard work as much as I can. Amen David, nature knows best! Peter Huntoon! You are an AMAZING Soul! 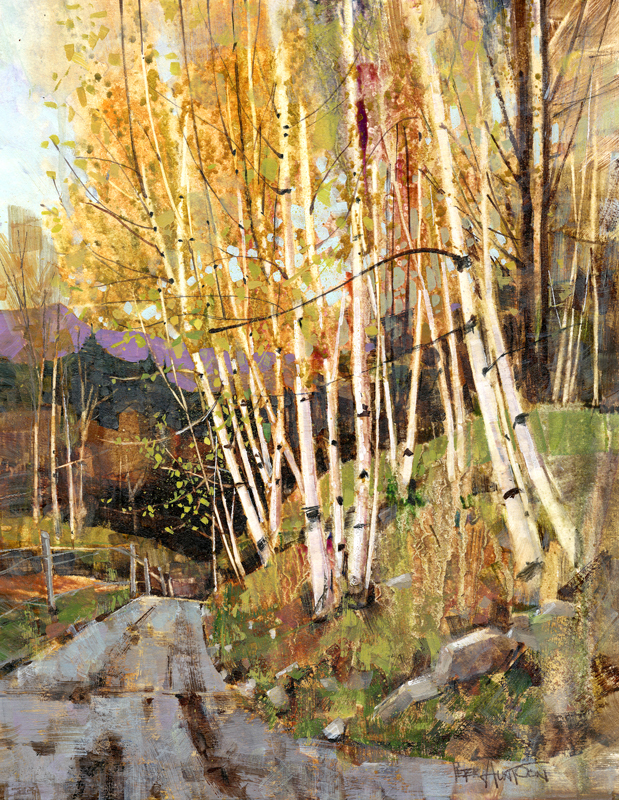 THIS PAINTING is speaks volumes….and…I supposed because I adore Birches….it speaks ever so much more profoundly! Thanks for still, yet another visual meditation! You are a sweetheart Victoria, whatever magic is at work I prefer to give credit to a higher power. I wouldn’t want that much responsibility! Another score for laziness! 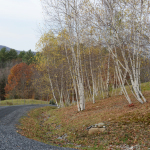 These birch trees are lovely – you did them justice. Another favorite on my Peter Huntoon List of Favorites! Indeed, thanks Betsy! The one I just painted is usually my favorite, unless of course it’s a dud. You just don’t see those. Thanks so much Muriel, I hope you guys can come to the demo Friday! Really enjoyed watching the video and seeing the final result, beautiful. Love love this painting and the video is like extra frosting on the side! Thanks so much again for sharing your gift. As long as nice people like you are enjoying this Day in Vermont adventure, I’ll keep sharing whatever I have. Michael! I was thinking of you a lot yesterday. Thanks so much for all your support, and for suggesting the Buy Now option. It seems to work very well! I’ll be in touch soon about Feb. I love this. Really beautiful. I am interested in what you paint on. Some one mentioned above a panel. Also your brushes that have that slant. I enjoy each painting you send out in your news letters! Hi Suzy, and thanks. See above for the panel details. My custom panel has very similar properties to the Ampersand Aquaboard, with good lifting ability until the paint starts setting up. My larger slant brushes are “Zoltan Szabo” brushes that I acquired in one of his workshops 20 years ago. I think you can still find them, or something similar. Happy painting! Love the birches and your video; always inspiring. Hope to see you Friday! Thanks Sue, look forward to seeing you! Absolutely beautiful. 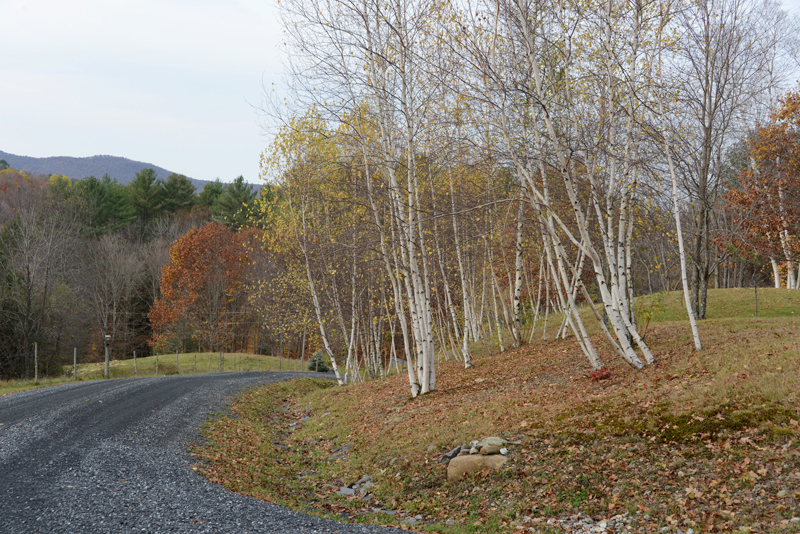 White birches are one of my favorites ,So Vermont !!! Thanks Ruth, and after painting them I too love em all the more. That tends to happen when you really stop to appreciate anything, or anyone. Incredible to watch you paint. I found you on facebook through a friend (Laura Moore, awesome watercolorist) sharing this and I’m glad she did. It hooked me when she mentioned you started the painting of my favorite trees (we call them Aspens out west) by splashing pink. How fun and wonderful this piece turned out. Thanks CheyAnne, glad we found each other! Glad you enjoyed the video. Having lived in Co for two years, I miss the west…Aspens, and esp Hatch Green Chile! What fun to watch you start your painting by splashing colors! Beautiful job! I will enjoy your videos! …and I have always loved birches too! Glad you enjoyed the video Lyna Lou, and welcome to A Day in Vermont! Peter, it is always a pleasure to see genius at work (even if that genius comes through a higher power). Seeing your work takes me to another place – calmer, peaceful, relaxing, reminiscent. Thanks Rob! I too prefer and prescribe to the original Greek/Roman definition of the word Genius: “The genius was the individual instance of a general divine nature that is present in every individual person, place, or thing.” From my experience, the higher power and Muse are most helpful and at work… when I am. They don’t often visit when I’m lying on the couch. I’ve just recently been turned onto your work and have to say thank you! your pictures are beautiful and each one leaves me with a smile….I look forward to enjoying them long into the future! So glad we found each other Abbie, and thanks for subscribing to A Day in Vermont. Onward we will go! !